The HSE have published their fatalities statistics. Provisional figures indicate that 144 people were killed while at work in 2015/2016 – up from 142 in 2014/2015. This is the second year running that the numbers have increased and is a worrying trend given the decline in inspection activity by the HSE and local authorities. Unfortunately the statistics were given little coverage when they came out. However, what should have been on the front page of every newspaper, was the report on mesothelioma that was published at the same time. 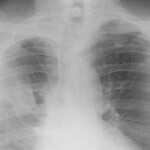 Most people have probably never heard of mesothelioma unless they know of someone who has suffered from it, but it is a form of cancer of the external lining of the lung. It is caused by exposure to asbestos and it is invariably fatal. What the HSE report shows is that, for the third year running, the number of deaths from mesothelioma has been over 2,500 and this level is likely to continue for at least the rest of the decade. I went through the figures since 1968 when figures first became available and added them up – a horrible task as, while you add the figures up, you are reminded constantly that every number represents a human being. The total for the number of people who are recorded as having died from mesothelioma in the past 46 years is 54,631. Given the high levels of under-diagnosis in previous decades, the true figure is much higher. We could have prevented most of these deaths if the government had listened to the unions and safety campaigners instead of the employers and asbestos industry when asbestos was being widely used in the 19600s and 70s. The importation and use of asbestos was banned in the UK in 1999 so of course we are now told that mesothelioma is soon going to become a disease of the past. Well it is not. There are still millions of tonnes of it in place in at least half a million commercial properties, and every day thousands of workers are put at risk of breathing in the fatal fibre. Whenever any kind of maintenance work is done on a building where there is asbestos it puts everyone at risk. 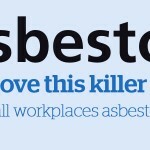 A survey of 500 tradespeople for the HSE showed that less than a third were aware of the correct ways to dealing with and handling asbestos in the workplace and only 15% knew that asbestos could still be found in buildings built up to the year 2000. That means that we will continue to have cases of mesothelioma so long as asbestos remains in place. The advice from the government that it is best kept in place unless damaged is clearly nonsense. All buildings are likely to have some work done in them at some point. 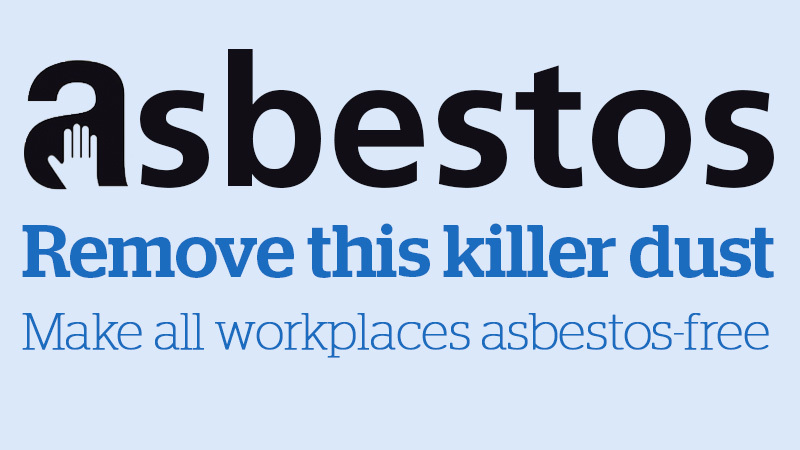 According to the HSE, 1.3 million tradespeople such as carpenters and joiners could come into contact with asbestos at least 100 times a year, with few workers knowing whether the deadly material is present in buildings which they are working on. Millions of shop workers, office workers, teachers, and hospital workers are also at risk as they work in buildings riddled with asbestos. There is no room for complacency. 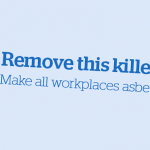 By safely removing and disposing of asbestos we can save thousands of people from dying of mesothelioma in the future. The TUC has been demanding a legal duty on all employers to do this, although the Government is currently refusing. In the meanwhile we are asking trade unionists in the workplace to negotiate with their employer to make sure that their workplace is properly surveyed and any asbestos in place is safely removed. Of course we also need to support those who develop mesothelioma. The TUC was instrumental in getting the government to ensure that any person who contracts mesothelioma as a result of their work gets full compensation and already tens of millions of pounds have been paid out as a result. We have also called for increased funding into research into mesothelioma both for treatments to assist those who develop it and also for ways of preventing it develop. Mesothelioma patients on average die within a year of their diagnosis and in contrast to many other cancers, treatments for mesothelioma are limited. However the government have recently given £5 million to establish a new National Mesothelioma Centre for research into the disease. This is to be warmly welcomed, although much more will be needed in coming years if the Centre is to reach its full potential. The fact that the Government has been willing to help address problems with compensation and research should not be sneered at. However, if it wants to really do something about this terrible disease, it has to take the more longterm review and work toward the complete eradication of asbestos. Only then will we be able to consign mesothelioma to the history books. With reference to the 4th paragraph, I am puzzled as to why 1999 is mentioned as the year when the import of asbestos was banned when I can remember the grave dangers of asbestos in the mid 1970’s and in 1976 in the factory where I worked, filter sheets with asbestos (for liquids) were replaced with asbestos free filter sheets. Through the Health & Safety department asbestos was then very carefully removed from buildings, equipment, etc in the factory over the next few years. The national HSE were continually warning councils, industry & commerse, etc, about the severe dangers of asbestos, so why please did it take until 1999 to stop the importing of asbestos? 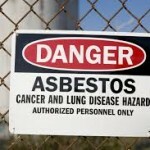 Equally important, where on earth did that very dangerous asbestos come from? My husband struggles every day because of an asbestos related ilness and cannot get any compensation because the company where he worked were not insured an absolute disgrace.